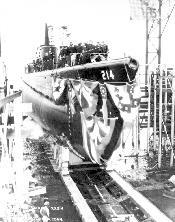 The Grouper, SS-214, was laid down at Groton, Connecticut, in 1940. A Gato-class vessel, she was on her second war patrol when she encountered the Lisbon Maru, having already sunk another Japanese freighter earlier in the voyage. There were no signs that the ship was anything but a troop transporter, so Grouper attacked. Of six torpedoes fired, only one found its mark. Alerted, the Japanese made a concerted effort to hunt down the submarine and she stayed surfaced for many hours. It was a matter of days later that the crew picked up a radio signal stating that they had sunk a ship carrying Allied POWs. By this time the surviving POWs had been taken to Shanghai, from where they would be shipped to Moji, Japan, arriving on October 10th. By this stage another 6 men had died. As they were transferred to POW camps at Kobe and Osaka, a further 85 were to die before the end of the month.